For 12,000 years, wolves have roamed Southeast Alaska's rugged Alexander Archipelago—a 300-mile stretch of more than 1,000 islands mostly within the Tongass National Forest. Now, their old-growth forest habitat is rapidly disappearing, putting the wolves at risk. As the region's logging policies garner controversy, a new study examines what the wolves need in order to survive. 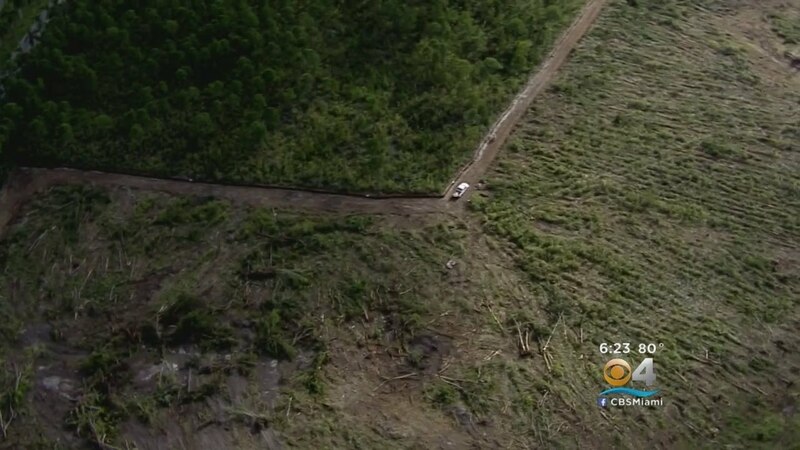 Environmentalists cheered after a Miami district court judge issued an emergency injunction on Friday to stop bulldozers from razing a stretch of endangered pine rocklands—one of the world's rarest forests, and home to species found nowhere else on Earth—to make way for a Walmart shopping center near Zoo Miami and Everglades National Park. Judge Ursula Ungaro's decision was made only hours after the Center for Biological Diversity, Tropical Audubon Society, Miami Pine Rocklands Coalition and South Florida Wildlands Association sued the Trump administration for approving the proposed Coral Reef Commons. Curbing global greenhouse gas emissions is the "single most important" action needed to protect polar bears, the U.S. Fish and Wildlife Service (FWS) urged Monday. Writing in a conservation management plan developed specifically for the species, the FWS emphasized that climate change-induced loss of sea ice cover, the bears' habitat, was a disastrous sign for the bears' survival and the number one priority to address to save the species over the long term. If emissions continue at current rates, only portions of the Canadian Arctic and northern Greenland may retain enough ice for bear habitat. "This plan outlines the necessary actions and concrete commitments by the service and our state, tribal, federal and international partners to protect polar bears in the near term," said Greg Siekaniec, the FWS's Alaska regional director. "But make no mistake; without decisive action to address Arctic warming, the long-term fate of this species is uncertain." "The plan shows the complexity of what it means to truly protect America's most iconic Arctic species," WWF's Arctic program officer and polar bear expert Elisabeth Kruger said. "It addresses the things we need to consider in near term and rightly highlights that climate change mitigation is the most important action needed to secure polar bear populations." The Center for Biological Diversity said the plan "fails to require the large-scale reductions in greenhouse gases needed to save the species." Shaye Wolf, climate science director at the Center for Biological Diversity, feels "recovery plans work, but only if they truly address the threats to species. Sadly that simply isn't the case with this polar bear plan." The Center for Biological Diversity added $10,000 on Friday to the reward for information leading to the arrest and conviction of those responsible for shooting and killing an endangered wolf earlier this month in south-central Oregon. The wolf—a female known as OR-28, who recently had a pup—was found dead Oct. 6. "The illegal killing of wolf OR-28 is heartbreaking. She was a pioneering animal, one of the first wolves to make the journey from northeastern to western Oregon," said Amaroq Weiss, the center's West Coast wolf organizer. "OR-28 was also a first-time mother, who leaves behind her mate and single pup to fend for themselves. This was a cowardly crime. I hope the perpetrator is caught quickly." Because she lived in the western two-thirds of Oregon, OR-28 was protected under the federal Endangered Species Act. Poaching a protected species is punishable by a heavy fine and jail time. In 2015 the Oregon Department of Fish and Wildlife reported six wolf deaths due to illegal shootings, ingesting poison or from suspicious but unknown causes. This is the highest number of illegal and suspicious wolf mortalities recorded in Oregon in a single year. Only one of the 2015 wolf deaths resulted in a conviction. Anyone with information about this case can call the U.S. Fish and Wildlife Service at (503) 682-6131 or the Oregon State Police Tip Line at (800) 452-7888. Callers may remain anonymous. News of OR-28's death comes on the heels of a statewide poll that found that the vast majority of Oregonians—from both rural and urban areas—oppose hunting as a way to manage wolves and believe wildlife officials wrongly removed state protections from wolves last November. The poll also revealed that most Oregonians believe nonlethal methods should be the primary focus in reducing conflicts between wolves and livestock. "Oregonians love wolves and want them protected. The poaching of OR-28 is a disgusting crime that shouldn't go unpunished," Weiss said. "Someone out there almost certainly knows who did this, and I really hope they'll step forward and help secure justice for this wolf." Think about our national parks. What comes to mind? Many of us think of spectacular landscapes, family adventures and, of course, incredible wildlife. These places we love are all of those things, but they are also places created to protect and restore wildlife. Our national parks, wildlife refuges and other wild public lands provide crucial habitat for wildlife, especially endangered species. The National Wildlife Federation is part of a coalition of more than 40 outdoor and sportsmen's organizations calling upon candidates seeking public office this November to pledge to protect our public lands and the wildlife that call these places home. Thousands of friends of wildlife have already pledged to protect our wild public lands and wildlife—and urged candidates and politicians to do the same. Endangered species don't have representatives in Congress: They need you to speak for them. Take action and ask political leaders and candidates to pledge to protect our public lands! Meet five of the many incredible endangered species and the public lands they call home. This medium-sized ferret is the only ferret species native to North America. Once widespread across western grasslands, these playful creatures are unfortunately now one of the most endangered mammals on our continent. 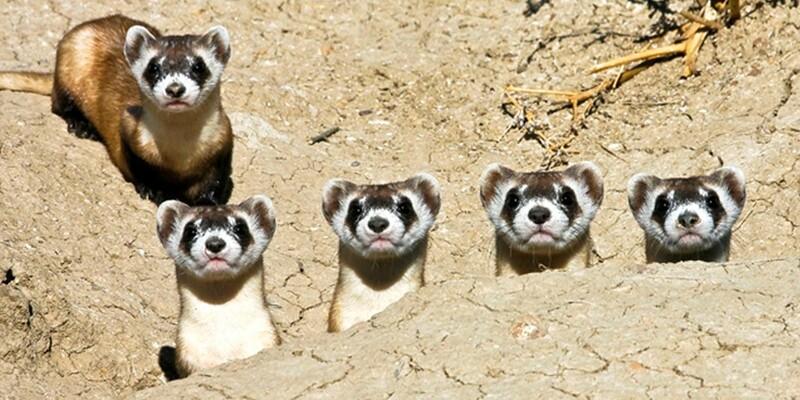 By the 1970s, scientists believed black-footed ferrets to be extinct, but a tiny population was discovered near a small town in Wyoming in the 1980s. Herculean captive breeding and recovery efforts by the U.S. Fish and Wildlife Service (USFWS) and other conservation partners have brought these ferrets back from the brink. Our public lands are still some of the only places where these animals have a chance of recovery. Where to see them: Rocky Mountain Arsenal National Wildlife Refuge in Colorado and UL Bend National Wildlife Refuge in Montana. These graceful cranes are the tallest birds in North America, with males approaching 5 feet tall when standing erect. 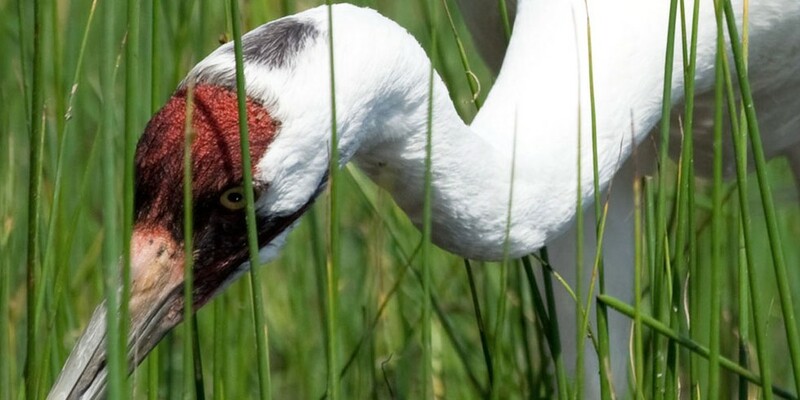 Named for their striking calls, whooping cranes historically migrated between breeding grounds in Canada and northern Wisconsin and wintering grounds on the coast of Texas and Florida. Sadly, the population of whooping cranes dwindled to just 16 birds in 1941. Extensive recovery efforts, involving captive breeding programs, have helped the whooping crane endure, but as of February 2015, the population still only totaled 603 individuals. Populations have been reintroduced at national wildlife refuges in Texas, Wisconsin and Florida. Where to see them: Aransas National Wildlife Refuge in Texas and Necedah National Wildlife Refuge in Wisconsin. These majestic animals are a subspecies of bighorn sheep unique to Sierra Nevada Mountains of California. 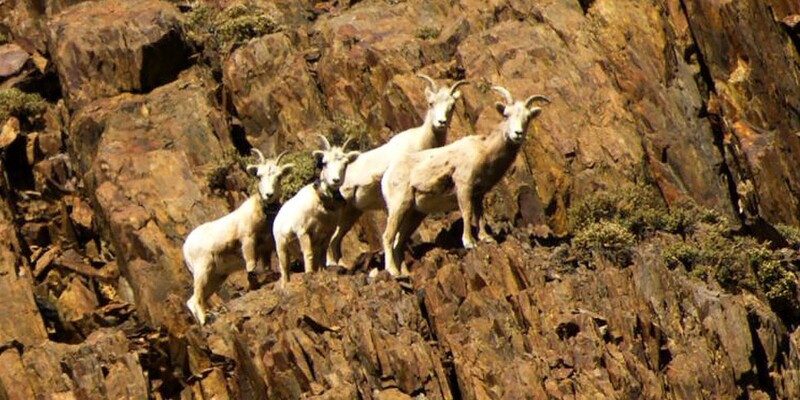 These sheep have specialized hooves to help them easily navigate treacherous slopes and terrain. By 1995, only 100 individuals remained. Thanks to the work of the U.S. Fish and Wildlife Service, the California Department of Fish and Wildlife and the Sierra Nevada Bighorn Sheep Foundation the populations rebounded to more than 600 by 2014. The regions crucial to their recovery are almost entirely national public lands, including two national parks, four national forests and Bureau of Land Management lands. Where to see them: Sequoia and Kings Canyon National Park in California and Inyo National Forest in California. The piping plover is a sparrow-sized shorebird named for its melodious vocalizations. Weighing no more than two ounces, the piping plover migrates between southern Canada and parts of the Carolinas, and is found along the Atlantic Coast and the Great Lakes. By 1983, the Great Lakes population of piping plovers was down to about 12 breeding pairs, leading to listing as a federally endangered species in 1986. Other populations along the Atlantic have been listed as federally threatened as well. 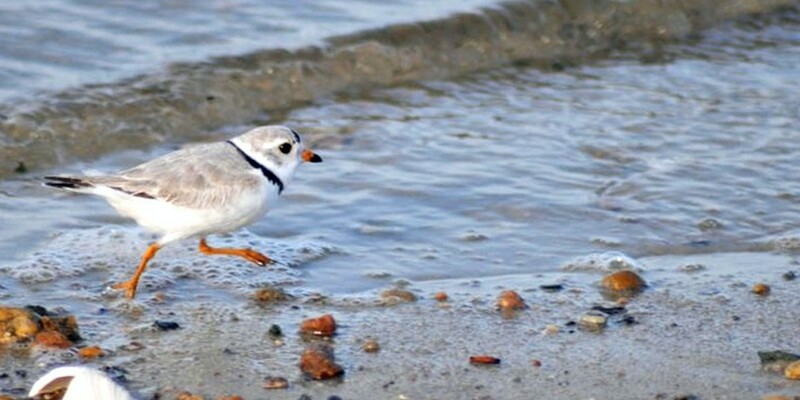 National wildlife refuges and national lakeshores and seashores have been crucial to protecting the piping plover's habitat, along with extensive public education programs. Where to see them: Sleeping Bear Dunes National Lakeshore in Michigan and Cape Code National Seashore in Massachusetts. 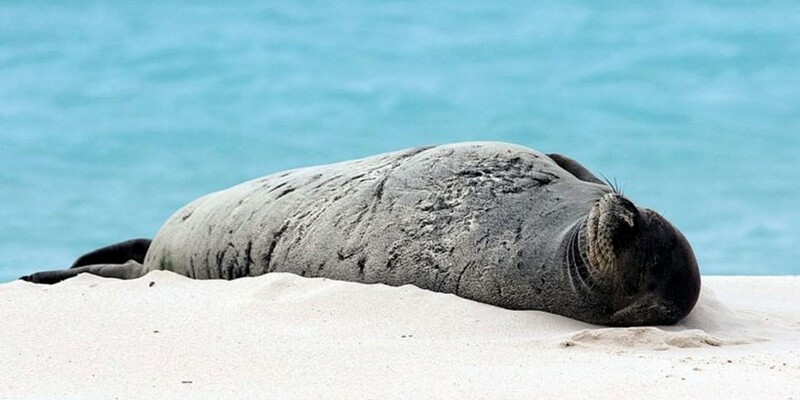 One of the rarest marine mammals in the world, Hawaiian monk seals are unique to the Hawaiian Islands. These playful seals weigh anywhere between 300 and 600 pounds, with a slender, torpedo-shaped body. Officially designated as an endangered species in 1976, the population still remains at only 1,100 individuals. Most of the population of Hawaiian monk seals lives within the protected boundaries of Papahānaumokuākea Marine National Monument, designated in 2006 and expanded in 2016. Where to see them: Midway Atoll National Wildlife Refuge in Hawaii, which is part of Papahānaumokuākea Marine National Monument. These are only five of the thousands of threatened and endangered species reliant on our nation's public lands. Whether their habitat is primarily found on a wildlife refuge, a national park or forest, or other wild public lands the sale or transfer or our public lands could be devastating for some of the most vulnerable wildlife in the U.S.
With only weeks to go before the November election this is an issue too important to ignore. Urge our political leaders and candidates to pledge to protect our wild public lands. The U.S. Fish and Wildlife Service (FWS) has listed two freshwater mussels—the rayed bean and the snuffbox—as endangered under the federal Endangered Species Act (ESA). The two mussels are found in river systems in the eastern U.S. The rayed bean is currently found in rivers in Indiana, Michigan, New York, Ohio, Pennsylvania, Tennessee and West Virginia, as well as Ontario, Canada. The snuffbox occurs in Alabama, Arkansas, Illinois, Indiana, Kentucky, Michigan, Minnesota, Missouri, Ohio, Pennsylvania, Tennessee, Virginia, West Virginia, Wisconsin and Ontario, Canada. In its final rule listing the two species under the ESA, FWS pointed to dramatic declines in their populations. The rayed bean has been eliminated from 73 percent of its historical range, and the snuffbox has disappeared from 62 percent of the streams in which it was historically found. The final rule appears in the Feb. 14, 2012, Federal Register. Threats to both the rayed bean and the snuffbox include loss and degradation of stream and river habitat due to impoundments, channelization, chemical contaminants, mining and sedimentation. Freshwater mussels require clean water—their decline often signals a decline in the water quality of the streams and rivers they inhabit. FWS will now work cooperatively with partners to develop recovery plans for the two mussels and coordinate efforts to conserve their habitats. Under the ESA, “endangered” means a species is in danger of becoming extinct throughout all or a significant portion of its range. It is illegal under the ESA to kill, harm or otherwise “take” a listed species, or to posses, import, export or conduct interstate or international commerce without authorization from FWS. The ESA also requires all federal agencies to ensure actions they authorize, fund or undertake do not jeopardize the existence of listed species. More information on mussels and endangered wildlife can be found by clicking here.